Mom, the Intern: Two years post-VBAC. I have to be honest. I had a lengthy post about my VBAC all typed up, but I just highlighted every last speck of text and hit the backspace button. I wrote it the other night while Dill was at Boy Scouts (he leads the 11-year-olds) and the kids were busy terrorizing everything in my bedroom. Dumping all the clean laundry onto the floor and filling the hamper with puzzle pieces, trucks and dinosaurs. Oh, that was Buckwheat. Bubby was actually being pretty good, playing Just Dance 3 on the Wii. The same MIKA song "Lollipop," over and over and over again. Dill got that game for my birthday, which happens to be tomorrow. But who's counting? Anyway, I was a little frazzled after a full day of housework and music lessons and was in no frame of mind to express my complicated feelings then. Alas, Buckwheat is now peacefully napping, Bubby is away at preschool, I just got back from Target and everything's peachy-keen. First, I'll start with a disclaimer: this post is not about VBAC's in general. It's just about mine (and Buckwheat's, really, since it was his body that came through my birth canal) and how it was and has been for me. So please, don't assume I am against VBAC's generally and that I'm going to be pushing C-sections on every expectant mother in the world from here on out. That's not what I hope to accomplish at all. In fact, I am still on the fence when it comes to C-section or VBAC for myself in the future. I only seek to inform. To relay my birth experience to others who are VBAC-hopeful so they won't go into it with only one side of the story. To offer another point of view. I don't know why I had a VBAC. I probably shouldn't have. Posterior baby, placental abruption, vacuum extraction. I don't know why my doctor didn't section me at the first sign of blood. I almost wish he had, but I realize what's done is done and there's no good in wishing things had played out differently. You can't go back in time and change the past. Maybe it was because he'd already been at the hospital for eight hours (hospital VBAC policy) and figured it'd all be a waste if he were to just slice me open in the end. Maybe it was because he genuinely wanted me to deliver vaginally. Maybe it was because he'd seen worse and didn't honestly believe it was that bad. But oh, it was. It was bad. My eyes brim with tears as I recall the anguish-filled weeks following Buckwheat's (then Smush) birth. Passing out on the hospital toilet due to the extreme pain caused by trying (and failing) to urinate once my epidural wore off. Hearing the nurse exclaim how "swollen and bruised!" my "bottom" was upon checking me. Being as white as a ghost for an entire day and consequently, very lethargic and weak. Feeling unexcited to have guests because I was in so much pain. Not being able to shift in bed or even walk for the first three days of my baby's life because it was too much to bear. Sobbing my eyes out on Bubby's bed from the unrelenting pain. Practically living in the sitz bath. Having to take a pillow to Buckwheat's first baby appointment because sitting without one was impossible. Crying out for Dill after Buckwheat's mid-night feedings because I couldn't get out of the rocking chair on my own. Taking 600 mg of ibuprofen every few hours and a daily stool softener for three straight weeks. Fearing every trip to the bathroom. Wondering if I'd ever feel normal again. Everything HURT. Plain and simple. And don't forget how Dill and I couldn't have "special marital cuddle time" for 6 MONTHS after the birth. Yeah. The causes: internal tearing, episiotomy, hemorrhoids and prolapse. Go ahead and Google those. And please don't tell me I had prolapse before the delivery. I didn't, I can assure you. Basically, I was a hot mess down there, and only time can heal those wounds. To this day, I'm still not quite right. I don't want to be graphic. I'll just leave it at that. Would it have been so bad if I hadn't been dealing with all the usual difficulties -- sleep deprivation, drastic hormonal fluctuations -- of post-partum life? Maybe not. And don't forget, I also lost two close family members by the time Smush turned a month old. Add in a few common breastfeeding issues and you've got one miserable experience. One I'd very much like to forget, which is sad considering it was the birth of my child. Mostly, I felt, and still feel, to some degree ... robbed. Ironic, because "robbed" is the word many women use in reference to their Caesareans: "Oh, I felt so wronged, so violated, so robbed after my C-section. But, I felt empowered after my VBAC! I had energy! I recovered so much quicker! It was a night and day difference!" So, I went into it thinking I'd be parroting the same encouraging phrases once my baby was born. But I didn't. All I could say when people asked how it went was, "It was really nice to hold him right after he came out." And I did mean that. I mean, look at that picture up there. You can't fake that kind of serenity and joy. I don't hate VBACs or feel like they should be banned or whatever. I also don't love C-sections. Though easier than the second, my first birth wasn't exactly a walk in the park, either. Basically, I'm putting off the next kid as long as God will let me, primarily because I'm really, really scared. Scared I will have yet another traumatic, ugly birth. One that will scar me in every sense and make me even more cynical about the process than I already am. I'm terrified that my body will be left broken and battered and useless. So, if you're wondering where the next baby is, please know I am taking time to heal. Physically, emotionally, mentally. I went through the most excruciating ordeal of my life last time and I am in no hurry to repeat it. I need time to think about my options, consider other methods and pray for guidance. Above all else, pray. I'd like my children to have siblings. I'd like to dig my elastic-waisted pants out from storage (ok, maybe not so much). I'd like to snuggle another freshly-baked newborn again. oh man that is just awful!! it's a shame you had a really bad experience with your 2nd. i'm scared to have more too, not because of the birth stuff, that is easy for me, but just the fact that i would be even more outnumbered. hahah. 2-good 3-oh crap! that's how i'm feeling right now. oh and happy bday in 2 days!! woot! 25 baby! Wow! An incredible story. While I am sure you can look at Buckwheat and revel in his little amazing body making it into this world, but women truly sacrifice so much during the delivery and postpartum process. I applaud you. You did well considering the turmoil that followed. Don't feel pressured to have another child (just because Buckwheat is 2) until you are ready. Time is your friend right now. I really didn't have a choice from the beginning and I honestly felt cheated but have come to terms with it. My 2nd c-section was 10 times better and I was able to hold my little one almost right away. They didn't have my hands strapped down. I much rather be cut above my pubic bone than cut or torn down below. I don't blame you for waiting. Your experience sounds awful! It's great that you still have options. Whatever you take, I hope you have a better experience. I feel you! My experience with my son (my first and only so far) wasn't a walk in the park even with the epidural. I pushed for 3 hours until they used the tongs. I then had 3 degree tears. Like you, I could not sit/stand/walk without extreme pain. It took 4 months-ish to feel normal again. That's so sad! I was in pain after delivery but that's pretty normal. I had tge most amazing birthing experience!!! That experience was what makes me want another baby! Crazy I know, but true. I had a midwife deliver and she does warm conpress to help prevent tearing and it worked great on me! No tearing or cutting! I could barely sit down so I just tried to stand up a lot. I have heard recovering from a c section is much worse than vaginal but I guess everyone is different. Maybe it was poor judgement on the docs part?? All I know is giving birth should NOT be traumatizing!!! Everyone should have a chance to experience giving birth and it being a beautiful experience :) Thanks for sharing your stories!! This makes me so sad! I'm so sorry! Being one who couldn't have a vbac and now will only have c -sections, i don't understand, but i can imagine! My first was an emergency c section, my 2nd an "elective" c section (because of insurance, hospital, etc.). Take all the time you need to heal both physically and emotionally- I would too! My story turned out a bit different than yours but I sincerely applaud your honesty. I remember when my VBAC didnt work and I was crushed that I had "failed" once again and would be a c section momma for life. But I have come to terms with it because the whole reason I dont have my babies vaginally are for the reasons you describe. Two ob's have told me I'm just too small down there and it would be detrimental to my body and/or to the baby. So what's done is done and I'm happy to have 2 healthy children. I just delivered baby number three and had my third c section two weeks ago yesterday. After the first, my heart felt, and the Spirit confirmed, that a c section was the way my babies would make it from my body into the world. And after this third baby weighed in at 9 freakin pounds 4 ounces, I must say that I'm super duper grateful that my lady parts didn't have to try and squeeze him out! Thanks for always being honest in your writing! I hope you continue to heal inside and out. And I know when when the time is right, you'll be inspired with what you need. Love you Jenna! Oh Jenna, I feel for you :-( I've only had one birth, and though it didn't go the way I wanted, I've been able to heal from it. I didn't have a c-section, but I had to deal with a jerk of a doctor who didn't listen to me. I suffered some PPD from the whole experience, and though I did love my son, I didn't feel entirely connected to him right away, and it hurts to admit that. What's helped me heal has been exactly what you're doing - prayer, and trying to decide what's best for our family. I really wanted to have a home birth with this one (I'm 19 weeks now) but our insurance won't cover it. I've been blessed to find a practice of midwives and doctors who are amazing. I literally cried at my first appointment because I knew I'd finally found the right place and people to help me have my baby. Whatever route you take, just remember that birth, however it's done, is a blessing. It's work, and sometimes it hurts, but it has a purpose, and time - and the atonement - can heal everything. Good luck in finding what's right for you! I'm so sorry.... That sounds awful. I wish I could say I know how you feel (ok, not really, because like I said, it sounds awful)... I've been beyond fortunate to have awesome easy births. Especially with Brigham. 3 1/2 hours of labor and 9 minutes of pushing. I think I was really blessed on his because Heavenly Father knew the weeks following would be absolute hell. I hope you continue to heal and whenever you guys decide to, I'll be excited for you to have another baby. And I hope everything hours perfectly next time! Part of me wishes I didn't read this post since I'm VBAC hopeful. Today's actually been a little bitter sweet for me because although it hasn't been a year since Shasta's birth, it was Good Friday last year that I checked into the hospital and didn't leave for 7 days. I'm sorry it was so awful for you. Hopefully the next one will be a walk in the park! And see, I always hear the traumas of c-sections: Cuts re-opening, scarring, uterine infections and ruptures. But then I hear all these scary things from vaginal deliveries too: epidural headaches, incontinence, needing stool softeners. So I just keep the details of my very low key, long but not scary, drug free birth experience to myself because no one wants to hear the non drama of it all. Haha, oh well. I LOVE talking labor and this post was great. So sorry your VBAC wasn't what it should've been!!! Seriously, you deserve a low key, no stress experience next time. Whether that comes via another VBAC or not is up to you. Good luck (in the future future!)!! Oh my gosh Jenna that sounds so awful im so sorry it ended up that way. :-/ i just had my 4th c-sec in 5 years and honestly i wouldn't give birth any other way! Scheduled csecs are awesome. When you are ready to have another baby you will know what to do! :) your kiddos are darling! wow, so awful. I'm so sorry. I think you had just moved in at that time and I had no idea and should have helped more! I would think that since your body has already been threw it, it would be easier the 2nd time and the baby would just slide out? :) But I have no idea and I hear ya, what a traumatic event to want to do it all over again. Schedule c-sections I hear are awesome too and I'm sure you'll figure something out. Happy birthday, enjoy your day!!!! My first was painful like what you were describing. I'm so sorry it was so bad. With my first, I tore and I think that made the pain worse. I was worried my second would be just as bad but I was surprised when it actually went better. I got an epesiotomy my second go around and I healed so much better and that was after pushing out twins! I like to think it was easier to heal and everything cause maybe my body knew what was happening that time. I hope the best for you. Bless your heart. I don't know what else I can say, but you definitely need the blessing. That is traumatic and I am so sorry. You are a beautiful mother. I don't know how you did it. I'm so glad Dill is a good husband to you. My question is, after two years, how do you feel physically today? Are you still in pain? You know, I've been thinking some more about it and wanted to share my thoughts. I had a bad experience with a vaginal delivery with Tommy (not nearly as bad as yours). The recovery was awful and I remember still crying when I passed a stool at three months. When I was pregnant with Charlie I went to a different OB and the experience was night and day. I attempted to go with the same doctor but I was continually anxious about another bad experience. I found a different OB that put all my concerns at ease. I think that if you find another doctor and tell him why your last experience was so awful, he/she could give you options that would save you some misery. Communication is key, so now that you can say what you DON'T want, and would much rather have a C-section to avoid such a bad experience, I think it will go a lot more smoothly. I wish you luck m'dear. Thanks for sharing your story and giving me something to think about! I had a really rough post-partum time as well. 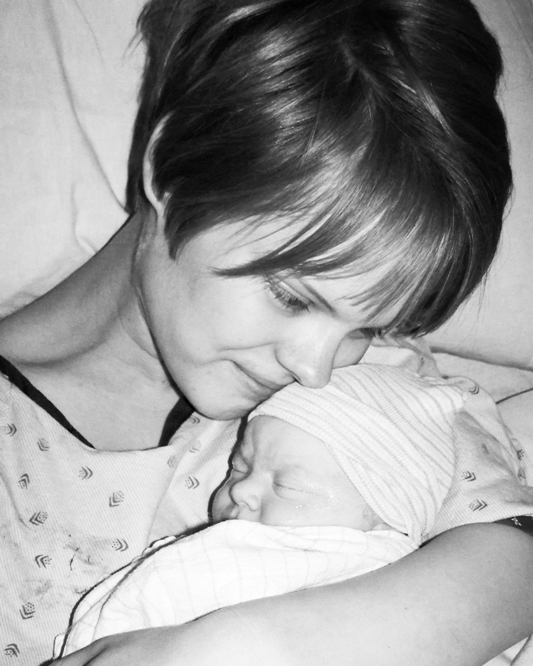 I had a non-emergent c-section at 41 weeks for a breech baby who ended up being tongue-tied. Nursing was horrible and my healing was ridiculously slow. I've decided that for some women, birthing children will be the hardest thing (physically, mentally, emotionally) that they will ever do. And other women will have great experiences with birth and have other trials that will be the hardest thing they ever do. Don't listen to those who tell you that it's a shame that your vbac wasn't what it "should" have been. What "should" have happened happened. And it might have sucked. But it was supposed to happen. I drive myself nuts thinking about what-ifs sometimes. Go, Jenna! WOO! I love Mom, the Intern! I can't STAND people's insistent meddling when it comes to child-bearing. First it's "When are you going to have children?" Then it's "When are you having another?!" Then it's "Arent' you done yet?!" I've had one 30-hour vaginal labor that was horrible to endure and great to recover from, followed by three unwanted c-sections. And I feel much like you - I'd really rather forget all of those birth experiences (and probably most of the first 10 days after my babies are born when I can't stop crying because they won't nurse or because I'm in pain or because I just decided to cry for a reason I can't quite name...). And I *think* I've finally come to terms with it all. But then somedays I change my mind and I'm still a little bitter. But in the end this is the mortal experience. I'm reminded that childbirth really is partly symbolic of the relationship we have with our Father in Heaven and Savior. All they've sacrificed to give us life and allow us this mortal probation - I can't begin to imagine how much anguish that must have caused, but if I were to try to imagine, I would start with the anguish I've felt bringing my own children into the world. Hard. SO hard. Seemingly impossible at times. But so utterly worth it. Jenna, I admire your strength! I pray that you'll have smooth birth-giving when you decided to have another child later in life. Also good for you to give your body time to heal! Thank you for sharing your story. I am so sorry you had such a horrible time. I don't blame you for wanting time to heal emotionally. Hopefully by sharing your story you have come a step closer. Good luck to you. I know through the Savior all things are possible so you will know when it is the right time. Thanks again. So good to know! I love informational posts like this. You never know if it will happen to you and it's great to have information beforehand that isn't all roses. That sounded so hard, I'm sorry you had to go through that! Props! Came across your blog through a friend who shared your response to the Hilary Rosen comment. Thanks for sharing. Had my first baby almost two years ago. Great birthing experience AWFUL recovery due to a third degree tear that not only took significant time to heal but also caused other complications that I will have to continue to deal with. My new OB (we moved states) gave me the option of a C-section after (doing my initial exam) for this baby which is due in 7 weeks. After much prayer, thought and talking to people I decided to do it. I'm terrified but feel like it's the only way to avoid a possible repeat and further irreparable damage that would scar me both emotionally and possibly physically. Not to mention the harsh judgement that I know will come from others but I'm trying to go with what I feel is right inside. Such a hard thing to do. Thank you for your honesty!